Yesterday’s wide spread up candle propelled the silver spot price rapidly through the key resistance level at $18.75 which had proved an obstinate barrier on previous occasions. This positive momentum now signals the continuation of the recent bull run from early February and in addition the instigation of a longer upwards move which has continued in trading today with silver prices currently breaching the $19.50 price handle. 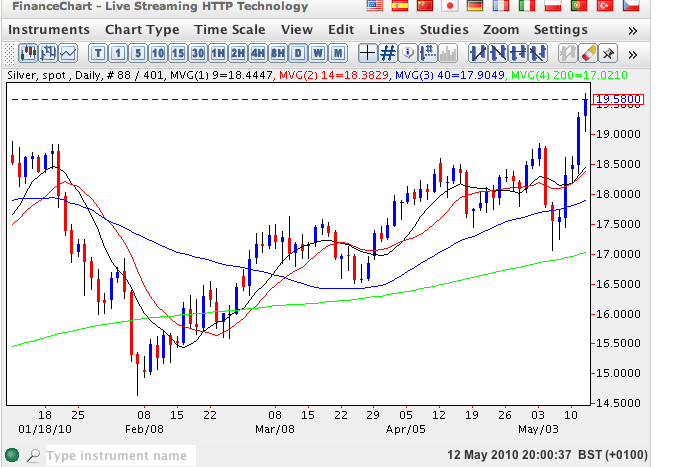 Both the 9 and 14 day moving averages have provided excellent short term support to this upwards move with the 200 day moving average below proving to be a solid barrier to any pullback. The short term target for spot silver remains our level at $21 per ounce and a break above here will signal a strong move higher which should reflect the breakout we have seen in the last few days in spot gold.